This article is an advocacy research for Tehran, promoting an implication of architectural design as a tool for citizen empowerment and positive environmental change. 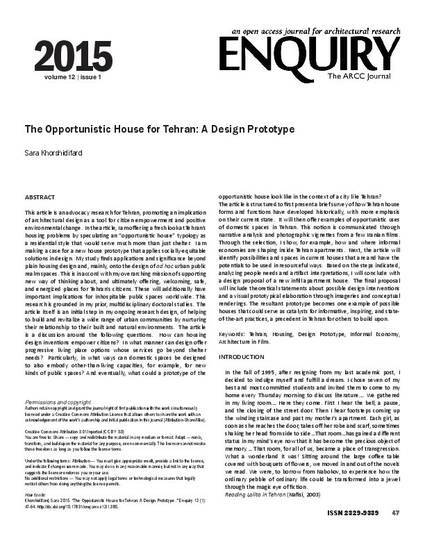 In the article, I am offering a fresh look at Tehran’s housing problems by speculating an “opportunistic house” typology as a residential style that would serve much more than just shelter. I am making a case for a new house prototype that applies socially-equitable solutions in design. My study finds applications and significance beyond plain housing design and, mainly, onto the design of ad hoc urban public realm spaces. This is in accord with my overarching mission of supporting new way of thinking about, and ultimately offering, welcoming, safe, and energized places for Tehran’s citizens. These will additionally have important implications for inhospitable public spaces worldwide. This research is grounded in my prior, multidisciplinary doctoral studies. The article itself is an initial step in my ongoing research design, of helping to build and revitalize a wide range of urban communities by nurturing their relationship to their built and natural environments. The article is a discussion around the following questions. How can housing design inventions empower citizens? In what manner can design offer progressive living place options whose services go beyond shelter needs? Particularly, in what ways can domestic spaces be designed to also embody other-than-living capacities, for example, for new kinds of public spaces? And eventually, what could a prototype of the opportunistic house look like in the context of a city like Tehran? The article is structured to first present a brief survey of how Tehran house forms and functions have developed historically, with more emphasis on their current state. It will then offer examples of opportunistic uses of domestic spaces in Tehran. This notion is communicated through narrative analysis and photographic vignettes from a few Iranian films. Through the selection, I show, for example, how and where informal economies are shaping inside Tehran apartments. Next, the article will identify possibilities and spaces in current houses that are and have the potentials to be used in resourceful ways. Based on the steps indicated, analyzing people needs and artifact interpretations, I will conclude with a design proposal of a new infill apartment house. The final proposal will include theoretical statements about possible design interventions and a visual prototypical elaboration through imageries and conceptual renderings. The resultant prototype becomes one example of possible houses that could serve as catalysts for informative, inspiring, and state-of-the-art practices, a precedent in Tehran for others to build upon. Khorshidifard, Sara 2015. “The Opportunistic House for Tehran: A Design Prototype .” Enquiry 12 (1): 47-64. http://dx.doi.org/10.17831/enq:arcc.v12i1.385.